On the 18th of September, A. D. 1780. aged 34 years. Remembrance, venerate the ashes here entombed. And hopes of life depend. Joseph Reed died a a little more than four years after his wife. William B. Reed, Esther De Berdt, afterwards Esther Reed, of Pennsylvania (Philadelphia: C. Sherman Printer, 1853), 332-33. The photo of the tombstone can be found here. In a letter to her brother dated 28 October 1775, Esther De Berdt Reed, back in Philadelphia, expanded on the mood of the times. It is with particular pleasure I now sit down to write to my dear Dennis, as I am free from the fear of any prying intruder; the thought that my late letters have been subjected to such curiosity has been a painful restraint upon me, and perhaps I have not been cautious enough in what I have written, but so it is, and if I have committed treason, it must remain. . . . [Mr. Reed’s] service has proved of so much consequence in the councils of the Camp, that he has devoted himself to the service of the public, and I doubt not it will give him as much pleasure in the recollection as any occurrence in his life; —indeed, my dear Dennis, the cause in which he is engaged is the cause of Liberty and virtue, how much soever it may be branded by the names of rebellion and treason. But I need not vindicate or explain the motives of our conduct to you. . . . It seems now to depend on the reception of our last Petition from the Congress to the King, if that should be so considered as to lay a foundation for negotiation, we may be again reconciled,—if not, I imagine WE SHALL DECLARE FOR INDEPENDENCE, and exert our utmost to defend ourselves. This proposition would have alarmed almost every person on the continent a twelvemonth ago, but now the general voice is, if the Ministry and Nation will drive us to it, we must do it, rather than submit, after so many public resolutions to the contrary. In this case . . . no trade can be carried on between the two countries. . . .
My dear little girl . . . has again recovered her usual health, but she is of so delicate a constitution, that she often droops and alarms me. My son Joseph and daughter Hetty are both well. Mama keeps her health and spirits amazingly. Mr. Reed has recovered his by his journey to the Camp. Everybody tells me he is grown so fat I should hardly know him on his return, which I expect will be one day this week. He has been gone from home above four months; his business has suffered not a little, but in such times like these every person must sacrifice something. . . . Adieu, my dear Dennis,—think of us often; remember we are struggling for our liberties and everything that is dear to us in life. Joseph Reed gave up a lucrative law practice in Philadelphia to become the secretary and aide-de-camp to General George Washington. He held the rank of colonel. The letter can be found on pages 96-97 of In the Words of Women. 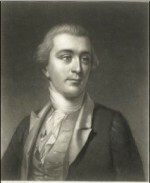 Reed’s portrait is by Charles Willson Peale, engraved by John Sartain. This post is a repeat of one dated February 6, 2012 as it properly belongs in this extended examination of Esther DeBerdt Reed. In July, 1775, increasing danger as well as the poor health of her daughter Martha forced Esther to move in with a friend in Green Bank (Burlington), New Jersey, and from there to Perth Amboy. After George Washington asked her husband Joseph Reed, now a lieutenant colonel with the Pennsylvania troops, to be his military secretary, he was absent from home a great deal. In this letter to her brother in England she shows herself to be a staunch supporter of the American cause. Amboy Septr 8th 1775You will see by the date of this my dear Dennis that I am from home; the health of my dear Girl which always suffers in the Summer Months was the Chief reason of my coming here. I find it very beneficial to her & pleasant for myself. . . . My dr Mr. R . . . . is . . . there amidst all the confusion & horrors of War, before this time you knew our dreadful situation, here indeed & every Southern Province. We only here the Sound, but it is such a one, as sometimes shakes my firmness & resolution, but I find the human Mind can be habituated to all most anything, even the most distressing Scenes, after a while become familiar. I am happy that Mr. R’s situation at the Camp is the most eligable he coud have been placed in, his accomodations, with the General [Washington], in his Confidence, & his Duty in the Councils, rather than the Field. While his person is safe from danger I chearfully give up his profitts in Business (which were not trifling) & I acquies without repining at his being so long absent from me. I think the Cause in which he is engaged so just, so Glorious & I hope will be so victorious that private interest & pleasure may & ought to be given up without a murmur. But where sleeps all our Friends in England? Where sleeps the Virtue & Justice of the English Nation? will nothing rouse them? or are they so few in Number & small in Consequence that tho’ awake, their voice cannot be heard for the multitude of our Enemies—how strange woud this Situation of things have appeared even in Prospect a few years ago? coud we have forseen it when we parted in England it would probably have prevented that Seperation. We might often, if we coud forsee Events provide against approaching evils, but I believe it is right we shoud not, for tho our private happiness might have been promoted, yet our Country woud not been benefited, for at this time she requires all her friends & has a right to expert services from such heads & hearts as can most conduce to her Safety. We impatiently wait to hear what effect the Battle of Bunker Hill has both on our friends & Enemies. A few weeks I suppose will let us know. . . . I take it for granted that I am writing to some curious person in office & that my Letter, insignificant as it is, will be open’d before you get it. One from Mr. Lane Secry of the Jersey Society to Mr. R came here with the seal quite broke as if it was done on purpose to shew they dare & woud do it. The excerpt is from In the Words of Women, Chapter 4, pages 95-96. Over time the tone of the letters of Esther De Berdt Reed to her brother Dennis in England began to change. She became more sympathetic to the patriot cause, eventually becoming a committed supporter. She wrote to Dennis on 2 November 1774 of the determined resistance to the Parliamentary Acts which Americans perceived as depriving them of their rights as Englishmen. when I tell you I have another daughter, you will not wonder that I have this time been a little negligent in answering letters. I assure you my hands are pretty full of business. Three children seem to take up all my time and attention. . . . Many people here are very sanguine in their expectations that the Acts will be repealed immediately. . . . The People of New England . . . are prepared for the worst event, and they have such ideas of their injured Liberty, and so much enthusiasm in the cause, that I do not think that any power on earth could take it from them but with their lives. The proceedings of the Congress will show you how united the whole continent is in the cause, and from them you may judge of the sense of the people. . . .
[Mr. Reed’s] business requires so much head work. . . . This with his late attention to politics has engrossed him more than common. . . . Of politics, I suppose you will expect me to say something, though everything now must come from you, and we are anxious to know what is to be the fate of this once rising country. It now seems standing on the brink of ruin. But the public papers will tell you everything, and Mr. Reed will also write you on the subject, so that little will be left for me to say, only that the people are in general united. The Quakers are endeavouring to steer a middle course, and make perhaps a merit of it to Government at home. How far their conduct will answer, I don’t know, but it is despised here. One great comfort I have is, that if these great affairs must be brought to a crisis and decided, it had better be in our time than our childrens. . . . The above excerpts can be found on page 95 of In the Words of Women. 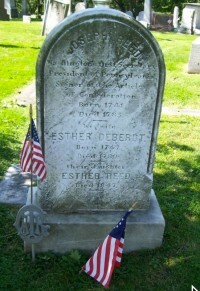 Esther De Berdt Reed kept up her correspondence with her brother in England wishing she could see him either in England or America. As tensions increased between Britain and her American colonies it became less and less likely that Joseph Reed would take a place in England as his law practice was doing quite well in Philadelphia, or that Dennis would obtain a position in America. Though Esther followed political events closely—she applauded the return of Lord Dartmouth as Secretary of State for the Colonies—she was still largely occupied with her children and their needs. She wrote to Dennis on October 20, 1772 with domestic news and new commissions. We have not yet had the box from on board the vessel: the basket we have opened; the walnuts are very fine indeed. . . . they are a great rarity here. The lamps, if we can manage them, will be of great use in summer, and perhaps will do to write by in the office. . . . The caps for Patty I would not have you purchase of Miss Gabells,—the ones you sent last year were made of such bad materials that they are now of no use. . . . To my other commission, I add a box of ivory letters for Patty, and a hat or cap for my son, fit for a child of a year old. I don’t like hussar caps and feathers; it must be something genteel, like a gentleman’s child, not a butcher’s. The gown I proposed to send for, I find I can have done here, and as it is not worth much, I shan’t take the trouble of sending. I have been confined the week past with my dear children, and the nursery has been almost all my care. . . . You see I have fulfilled your wish of a son. I wish I could stop with that number, but I don’t expect that. . . .
William B. Reed, Esther De Berdt, afterwards Esther Reed, of Pennsylvania (Philadelphia: C. Sherman Printer, 1853), 180-82.